If the most pressing issue for the Big 12 in its new configuration is how to schedule West Virginia road trips, there isn't much to be concerned about going forward. The Big 12 men's basketball coaches wrapped up their meetings Tuesday in Phoenix with its new members -- West Virginia and TCU -- replacing the departed Missouri and Texas A&M. 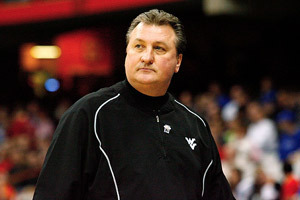 Chris Chambers/Getty Images The Big 12 welcomes WVU, which has made five straight NCAA tourney trips under Bob Huggins. And the consensus was that the league is actually as strong as it's ever been. "I never questioned the stability," Texas coach Rick Barnes said. "The anchors were always the ones that wanted to keep it together -- Texas, Oklahoma and Kansas. I know our AD [DeLoss Dodds] never wavered on keeping the league together. We're very comfortable with where it is right now." The Big 12 made an easy switch in adding West Virginia and TCU. The league will continue as a 10-team conference for the foreseeable future with a new television agreement that will ensure even more status quo. Kansas is coming off an appearance in the national title game. Baylor made an Elite Eight trip for the second time in three years. And four others made the NCAA tournament, meaning 60 percent of the league went dancing. The odds are high that the Big 12 can duplicate that percentage going forward. And keeping the conference at 10 teams also ensures that the round-robin schedule will continue. The Big 12 is now the only conference among the power six that plays a true round-robin. "It's the best basketball league in the country," Barnes said. "Divisional play wasn't fair. [With the round-robin] you play everybody twice and the rivalries continue, so we can build our league." Even though his team won the conference yet again last season, Kansas coach Bill Self said the 18-game, round-robin schedule was "tiring." "I thought it was long. My opinion is that the perfect number of league games is 16," he said. "But it was still great and it was better from a fan perspective to play everybody twice. But it's a long season." Iowa State coach Fred Hoiberg called the league slate a "grind" but added that crowning a true champion was a "great format, and it really prepared you for the postseason." New Kansas State coach Bruce Weber didn't have a true round-robin with Illinois in the Big Ten. But he did when he was at Southern Illinois in the Missouri Valley. "As far as getting in the NCAA tournament, it helps your RPI and gets you more quality games," Weber said. Trent Johnson, who came over from LSU to TCU, said he enjoyed the Pac-10's round-robin schedule while head coach at Stanford and that it "was the right way to determine a true champion." West Virginia coach Bob Huggins agreed. "It just makes it hard if you don't play everybody twice," Huggins said. "It's more fair to play everybody home-and-home. I think we went to Syracuse 12 years in a row. Well, maybe it was three, maybe four." Weber, Johnson and Huggins all said they were impressed by the growing sense of stability in the Big 12. As for going to Morgantown, a place that is 870 miles away from its nearest Big 12 neighbor (Iowa State)? Well, this is an era in which every team travels by charter, so by and large the coaches contacted by ESPN.com didn't seem all that concerned. Hoiberg said the trip to WVU will be looked at like the road trip to Colorado in the Big 12 before the Buffaloes left. As for the Mountaineers' schedule, Huggins said he wouldn't be against playing several road games -- a Texas road trip for example -- in early January, when school isn't in session. The Big 12 said that's unlikely, however. "It's not my call," Huggins said. "I'll do what they want."